Inky Dream: Black and Pink Wednesday. I managed to finish the card I was working on last night. In between watching LOST I got it done. My desk is an absolute mess though. Tonight I'm gonna spend tidying and re-organizing my work space. Is it wrong that that I'm looking forward to that?! 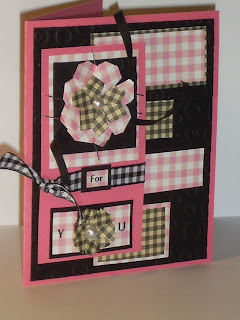 Crafts 4 Eternity has a sketch, using black and pink, with staples. Kaboodle Doodles wants fancy folds. Farrah its absolutely gorgeous, love your gingham papers and those cute flowers...perfect. Thanks for playing along at C4E this week. Yes it's very wrong! LOL! but you can come and tidy mine if you like! Love your card! 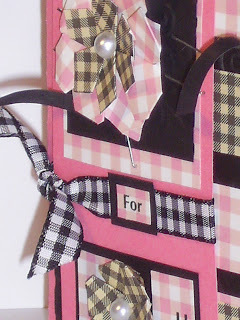 Pink and black always makes for a stunning combo and I just adore gingham! This is just FAB & FUNKY!! Love it. Don't take this the wrong way, but my faourite bit is the staples, I really like how you incorporated them! The whole card is great, your interpretation of the sketch is fantastic. I'm not sure I would be looking forward to tidying your work space. But sometimes you find some forgotten treasures! Look forward to seeing you use those next week, LOL!! Thanks for joining us at C4E. Thanks for joining C4E and hope to see you next week. Another great card! It's nice not seeing an "image" in the "image" spot LOL Great take! LOVE LOVE LOVE the gingham! Thanks for playing C4E this week! Very fun card, cool fold and love the colors you chose! I also need to get my workspace cleaned up:) Thanks so much for joining us this week at Kaboodle Doodles.